For centuries, men have pondered what exactly is meant by the ‘good life’. I couldn’t even begin to go into the detail that the likes of Plato, Epicurus and Socrates did when exploring the delicate balance between virtuosity, pleasure, wealth and power and what that means for our happiness. 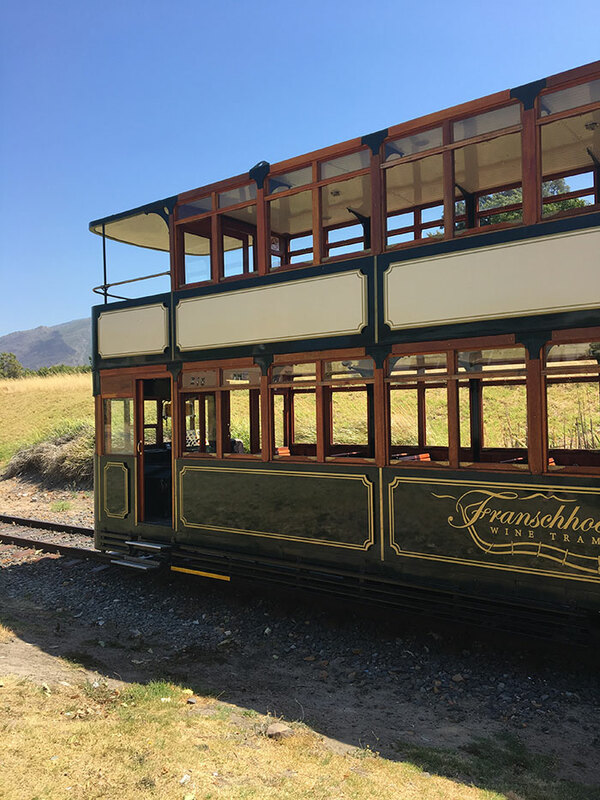 However, I can’t help but feel that they would have saved themselves a lot of effort had they just climbed on board the Franschhoek Wine Tram – because this is the good life, my friends! 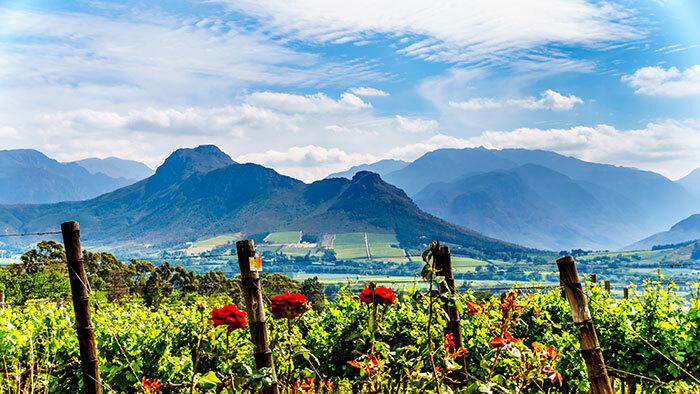 Franschhoek is a small town about 90 minutes’ drive from Cape Town, perhaps only rivaled by nearby Stellenbosch when it comes to names synonymous with wine making (and wine drinking) in South Africa. In times gone by, the local farmers relied on the town’s railway to transfer their harvest to market, a need which largely fell away in the latter part of the 20th Century and resulted in the railway line falling dormant in the late ‘90s. And so it stayed until 2012 when some enterprising local vineyards hit upon the idea of the Wine Tram, and the railway line sprung back into life with great effect! Today there are eight lines to choose from, each of which provides a hop-on-hop-off service and enables guests to explore a different part of the Franschhoek Valley. All of the lines are serviced by a double decker and a single decker tram, each offering incredible views of the surrounding countryside. The tram picks up from each location roughly every hour and there is the opportunity to visit up to six different estates, where you can taste the wine for an additional fee. The settings are truly spectacular: huge mountains rise high into a pure blue African sky with the rays of the sun cooled by gentle Cape winds, all experienced amongst the estates’ lush gardens and manicured lawns. It’s not just about the wine though, as many of the estates have art galleries and some of the region’s top restaurants can be found here too. Leaving from Cape Town, the urban sprawl began to dissipate as we weaved through vast valleys and past long driveways with entrance gates to famous and familiar vineyards such as Meerlust and Uva Mira. On arrival in Franschhoek we were immediately struck by just how pretty it is. This may be a tourist hot spot, but the mood felt relaxed, the town full of people enjoying the good life. After a quick coffee we were met by a guide who directed us to the tram, where we were greeted with a glass of rosé before heading setting off. On arrival at the Rickety Bridge, we disembarked and made our way onto an open-sided trailer, pulled by a tractor, which would take us to the winery’s main house. Here we began the hard work of discovering what exactly made the region’s wines taste so good. In order to really get a full overview, we sampled everything from the Sauvignon Blanc through to the Brut Rosé. In addition, we also went on a tour of the vineyard and learnt more about the winemaking process, as well as the history of the vineyard itself and the early French Huguenot Settlers after which the town of Franschhoek (‘French Corner’ in Afrikaans) is named. Following a delicious lunch, returned to the tram and headed to our next tasting at La Provence Estate. Here we had a chance to look around the excellent art gallery as well as relax in the beautiful gardens before sampling more wine. Tasting both red wines and the whites which are more associated with this region, we learnt more about the grape varieties are harvested here. The afternoon finished at the final estate, La Bri, where we learned about food pairings, matching chocolate, biltong or Turkish delight to the wines on offer. Following some last minute purchases at the winery’s gift shop, we were back on the tram and heading towards the center of town again. Spending a day drinking good wine, with good friends and family, and eating great food while taking in breathtaking scenery, all under the African Sun: in my quest for the good life I can’t say I have found anything that beats the Wine Tram. 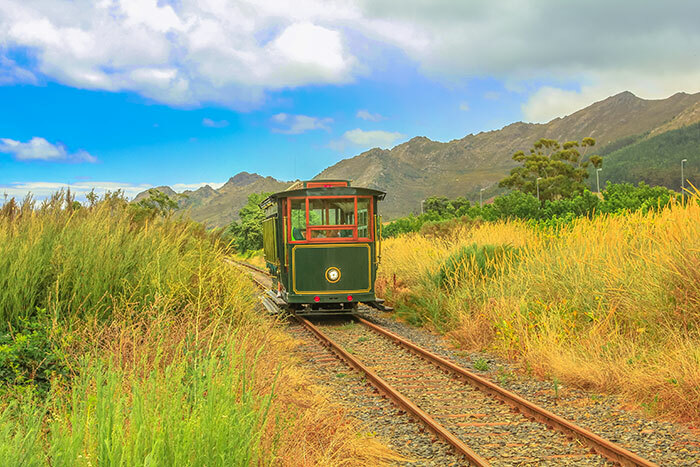 Speak to one of our Travel Experts about tailor-making your South Africa holiday to incorporate the Franschhoek Wine Tram.